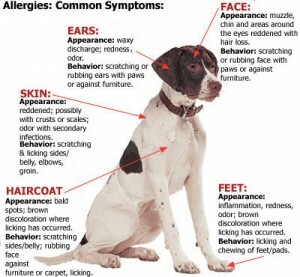 Food allergies are common in dogs, and we recommend that you avoid foods that contain ingredients such as corn (any form), wheat, brewers yeast, any form of by-products and artificial flavours and colourings (even if it’s called “natural” flavour – there is no regulation of the word natural in pet food). These grains are the most common allergens and in any case, are not a good nutritional basis for dogs as they are not well designed to digest grains. Sometimes dogs can be allergic to particular meat proteins though. Turkey and beef are common culprits, though dogs can also be allergic to chicken, lamb, fish – in fact just about anything. Some manufacturers do produce foods made with fewer and less common meat protein sources and without grains that can be very useful for allergic dogs. Examples include duck and potato, venison, bison, or fish and potato formulas. If you suspect your dog has allergies, then choosing a food with a low number of grains and only one or two different meat protein sources is a good start (eg. a food with chicken and lamb, rather than chicken, turkey, lamb and fish). Common signs of food allergies are red itchy skin, ears or feet, persistent ear infections, diarrhea and throwing up, and raised bumps on the skin.